According to Walk Free foundation there are almost 30 million slaves in the world. Of those about 14 million live in India, the country with the highest number of slaves, whereas in Mauritania about 4% of the population are enslaved. According to the same foundation slavery generates up to 32bn$ of profits for slaveholders around the world (about 1k$ per slave). 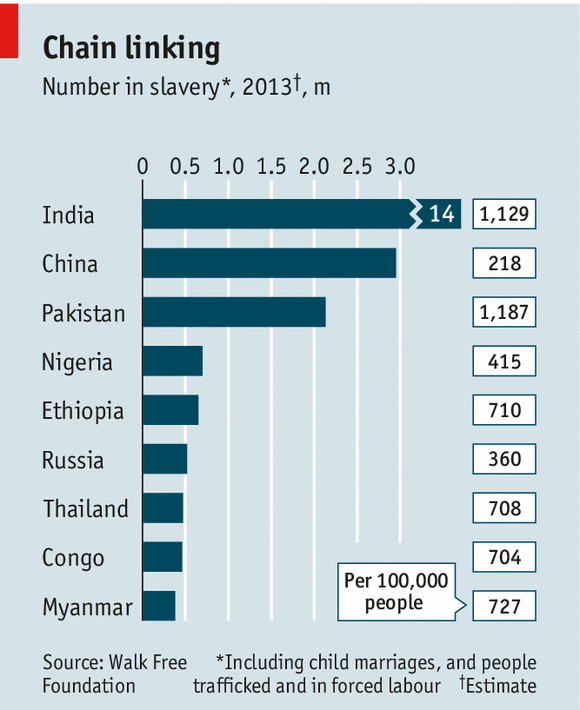 Graphic from The Economist, source: Walk Free foundation. About at the same time I received a letter from the Africa Programme coordinator of another foundation I contribute to, Anti-Slavery (of which I have written before). The letter tells the story of Ibrahim, a former slave from Mauritania. He was born a slave and found himself alone when his mother and siblings fled from their holder. When Ibrahim grew older, the master brought a woman-slave to mate Ibrahim so he would find it more difficult to leave a family behind. He nevertheless escaped. Ibrahim has tried to free his family without success. He found little help from local authorities and was beaten up in one of his tries. Anti-Slavery role in the story is to help Ibrahim and others in his situation seek justice, to support them and help them rebuild their lives. Ibrahim is now receiving legal assistance so he can file criminal charges against his former master. I normally don’t like very much when I receive letters from the charities and NGO’s I already support. My first thought is “if I already collaborate with you, save those euros of paper, envelopes, stamps, etc., and direct them to either projects or outreach towards people who don’t support you yet!”. This time I thought it twice and decided to try to voice the cause further. Two final figures from that letter: it costs £48 to provide emergency accommodation for a month for a family released from slavery, and as little as £6 to provide a training session for a local support worker.